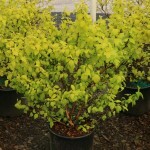 A mid-sized shrub with bright yellow spring foliage that matures to lime green. Fall color is orange and yellow. It has winter interest in the brown exfoliating bark that shows white bark beneath. 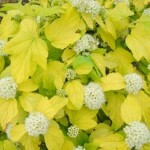 It has rounded clusters of white flowers in the spring. 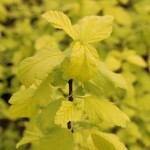 Plant in full sun to partial shade in climates with hot summer sun. Prefers an average, slightly acidic, well-drained soil.